Pharmaceutical compounds and formulations, both in academic research and production, are traditionally investigated using X-ray diffraction (XRD). 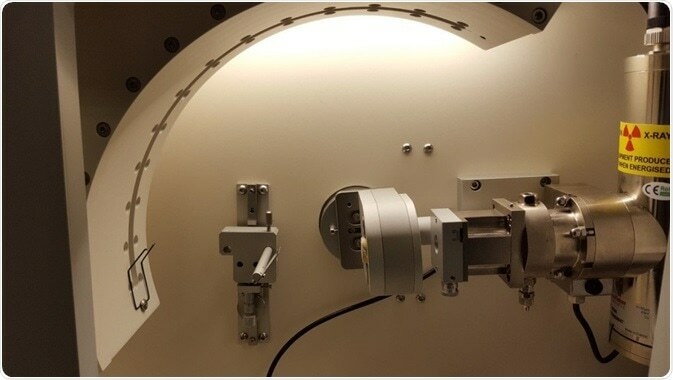 With the increasing need for novel drugs to better serve the society, there is a huge demand for multipurpose X-Ray diffractometers to support comprehensive pharmaceutical research. Many different compounds, including active pharmaceutical ingredients (APIs), are exposed to stringent screening procedures such as polymorphism, salt formation, or co-crystallization during quality control of research and production. These steps can easily be accomplished using powder X-ray diffraction, which has an inherent sensitivity as well as the ability to distinguish between various crystallographic structures. In addition, dynamic studies can be performed, and the crystallization behavior of compounds in non-ambient conditions or different solvents can also be followed. Moreover, the crystal structure of novel compounds from powder data can now be routinely investigated. X-ray diffraction allows tracing impurities during drug synthesis, and thus enhances processes. The Thermo Scientific™ ARL™ EQUINOX Series includes a family of XRD instruments that range from basic, easy-to-use bench-top systems for routine analysis to more sophisticated high-performance, floor-standing, research-grade instruments. 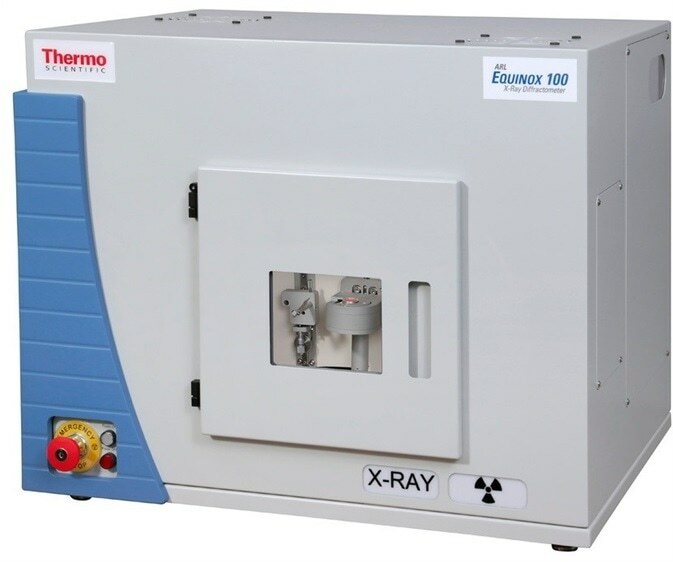 The Thermo Scientific™ ARL™ EQUINOX 100 is a versatile XRD instrument that uses a custom-made 50 W Cu or 15 W Co high-brilliance micro-focus tube with mirror optics which eliminates the need for an external water chiller. It is easy to transport the instrument between labs or into the field without any need for special equipment. Compared to other diffractometers, the ARL EQUINOX 100 affords extremely fast data collection as it features a special curved position sensitive detector (CPS) that simultaneously measures all diffraction peaks and in real time. Therefore, the unit is perfect for transmission mode measurements, as shown in Figure 1. Ibuprofen samples were acquired from four different vendors. These were then ground and transferred into transmission measurement cups with the help of scotch tape. 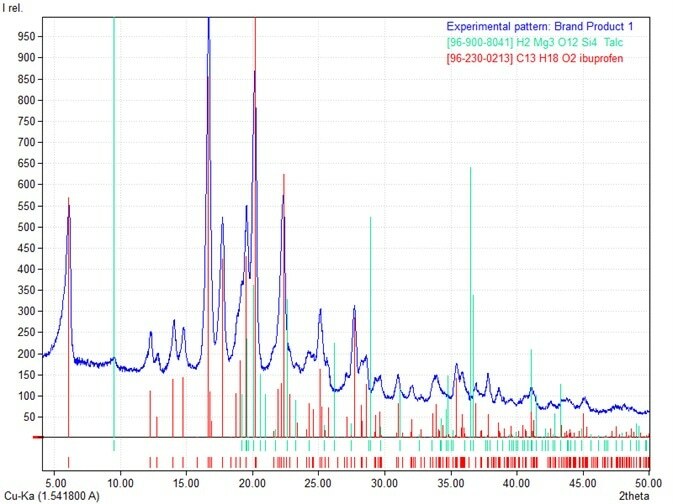 Using Cu-Kα radiation (1.541874 Å)., each sample of Ibuprofen was rotated and quantified for a period of 10 minutes. Finally, data processing and assessment was carried out using MATCH! integrated with the COD database for detailed qualitative phase analysis. A range of non-API compounds are present in Ibuprofen products (200 mg), both generic and brand-name, that are likely to differ from one vendor to another. These compounds include pigment, cellulose, or filming agents. Crystalline phases in such mixtures can be clearly differentiated through the XRD technique. 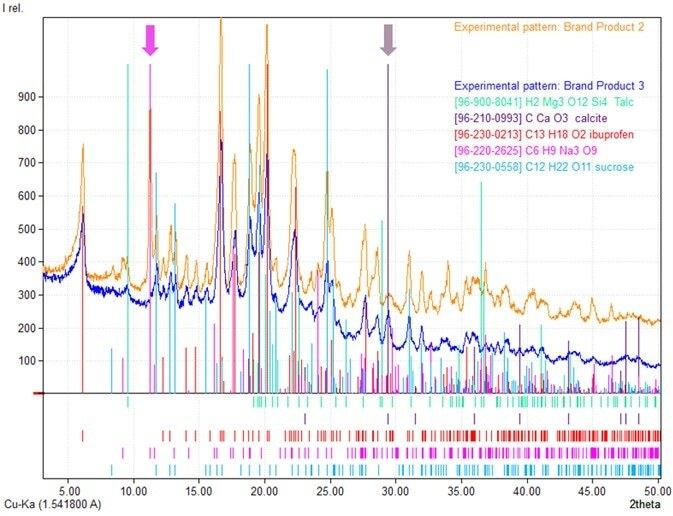 Shown below are four types of samples obtained from various vendors, demonstrating varying different formulations (peak positions are highlighted as vertical lines). Thus, the diffraction patterns of various products show differences which can be seen clearly (Figure 3). Many generic products are available on the market, wherein one was investigated with Ibuprofen being the only crystalline phase (Figure 4). 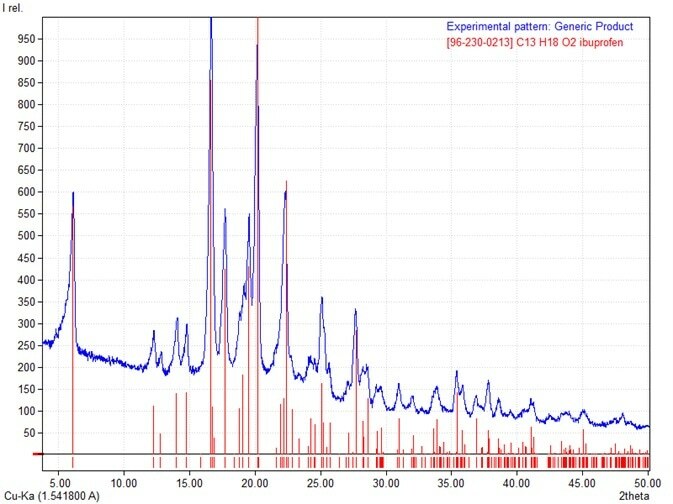 The results obtained are also similar to a specific brand product where just traces of talc (green, utilized as a lubricant) can be detected (Figure 5). Apart from these two examples, additives (additionally to talc) are used by some vendors to achieve different means (Figure 6). Compared to Brand Product 3, Brand Product 2 has no calcite (grey) but contains sodium citrate (purple) (arrows indicate differences). Calcium carbonate and sodium citrate are used as buffering agents to protect the stomach against the harmful effects of Ibuprofen, while sucrose (blue) is more pleasant tasting. 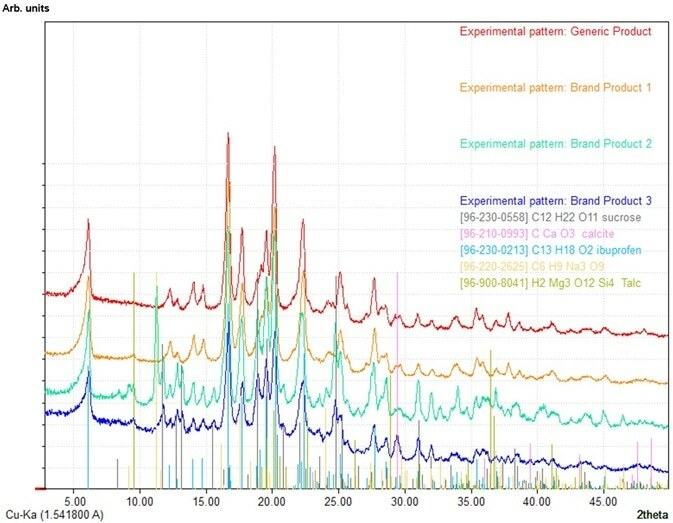 By leveraging the excellent resolution of the Thermo Scientific™ ARL™ EQUINOX 100 in transmission mode geometry, the crystalline phases in various pharmaceutical mixtures can be clearly resolved. A measurement time of 10 minutes is more than sufficient to carry out a qualitative phase analysis as well as to detect trace phases. Therefore, the ARL EQUINOX 100 is a simple, easy-to-use instrument that is suited for all areas of pharmaceutical research or production, ranging from pre-formulation through to QC/QA of the final drug product.